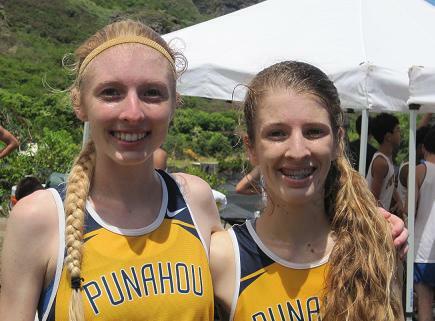 Punahou sisters Elli (l) and Teri (r) Brady celebrate their 1-2 finish at Ka'a'awa Valley Saturday. (Ka'a'awa, Oahu) As always, the Ka'a'awa course was hot, hilly and difficult. Punahou Senior Elli Brady (19:17), and her sister, Freshman Teri Brady (19:57), completed the 1-2 sibling sweep, leading a deep Buff ‘n Blu squad (25) to victory in the Girls Varsity 3-Mile race. Kamehameha-Kapalama (58) took second, introducing the ILH to their fast freshman and third place finisher, Hi’i Ellis (20:06). Iolani (64) took third place team honors led by their speedy freshman and fourth place finisher, Amanda Beaman (20:20), completing a 2-3-4 showing by the ILH class of 2016. Meanwhile, PAC-5 (111) squeaked by Hawaii Baptist Academy (112) for the team fourth place finish. In the Boys Varsity 3-Mile race, the Buff ‘n Blu (28) also displayed depth by finishing all five of their scoring runners in the top ten. Iolani (63) edged Kamehameha-Kapalama (66) for second place. Warrior Junior, Davis Kaahanui (16:53) won the individual overall crown ahead of the HHSAA 1500M Champ, Nikolai Scharer (17:00), and Jacques Hebert (17:00), both from Punahou. Hawaii Baptist Academy (111) finished third, followed by Mid Pacific Institute (128), Saint Louis (135) and PAC-5 (179). In the Boys JV 3-Mile race, Punahou (35) slipped by Iolani (41) while Hawaii Baptist Academy (64) finished a strong third. In the individual race, Junior James Umphress (19:07) of Punahou nipped Sophomore Austin Ellison (19:08) of Iolani for first. In another duel, Freshman Connor Murakami (19:16) of Punahou out-sprinted Junior Jonathan Huster (19:18) of Hawaii Baptist Academy for third. In the Girls 2-Mile Open race, Punahou scored a perfect fifteen over Iolani (61), PAC-5 (84) and Kamehameha-Kapalama (95). The individual race was won by Buff 'n Blu Freshman Elle Bower (14:01), followed by Sophomore Caitlin Green (14:42) and Freshman Mikayla Fujiwara (14:47). ILH action continues next week as the Raiders host the popular and most competitive Iolani Cross Country Invitational this Friday at 2:30 PM on the rolling hills of the beautiful Kualoa Ranch on Oahu’s Windward side. In addition to Hawaii’s top teams and runners, spectators will see California represented by Cerritos High School, Clovis High School, Dana Hills High School, Lynbrook High School, Marywood Palm Valley High School, Northgate High School and Palos Verdes High School .